Rachael Ray had me intrigued. 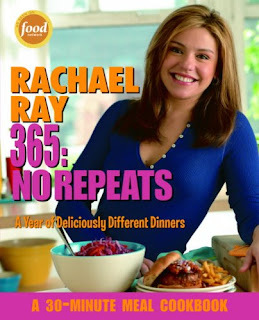 The big change for me came when the show had a guest featured who was an everyday lady and had purchased her 365: No Repeats cookbook. This woman was determined to try out every single recipe in the book for an entire year. I heard terms like 'successful', 'easy', 'delicious' and 'fun'. Is this what I have been looking for? I decided it was worth a try and went online to order the cookbook. I received it within a week and for the first time in my life I decided to read the introduction. I think it's because I liked her thank you notes that preceded it. 30-Minute Meals. I have since learned that this does not include the prep time needed which for me was much longer in the beginning as I finally braved learning how to use of my Chef Knife. Her promise that you'll never get bored and that every night can be full of new flavors! I felt like this cookbook was written specifically for me. I was definitely interested. Now I just needed to get cooking. What or who has inspired you in the kitchen? Is it a family member or a friend? Maybe a special cookbook that is your 'go-to' resource. Please share! my friends E., A. and my husband have inspired me in the kitchen. I have quite a few cookbooks that I love to use. Ever since I started to cook, I always thought that it would be cool to cook through a whole cookbook, but since there are certain things that I cannot eat - that is not going to happen! LOL Oh, and this was before Julie and Julia came out!